Give every ensemble a feminine touch with this beautiful brooch. Add a dash of drama with a bold eye-catching brooch. 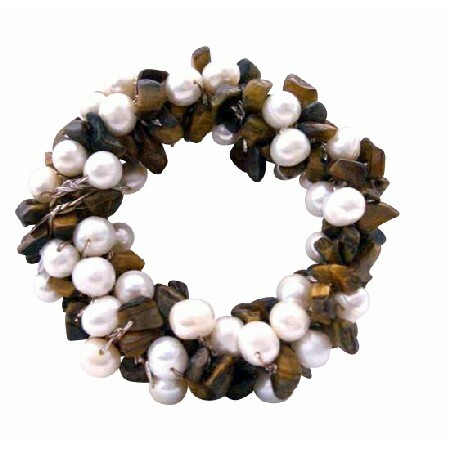 Made with Pearls artistically handcrafted brooch made with White Freshwater Pearls good quality of Pearls with Tiger Eye Nugget Chips beautiful NEW!Picture this lovely brooch on your favorite dress shirt scarf or jacket lapel. A beautiful accessory for any occasion. Secures with a standard pin clasp. A great gift idea or an addition to your jewel collection.The pin portion of the brooch extends almost 1/2 inche past the clasp & is positioned on the brooch in such a way that you can wear it turned various ways.An absolutely gorgeous vintage brooch.